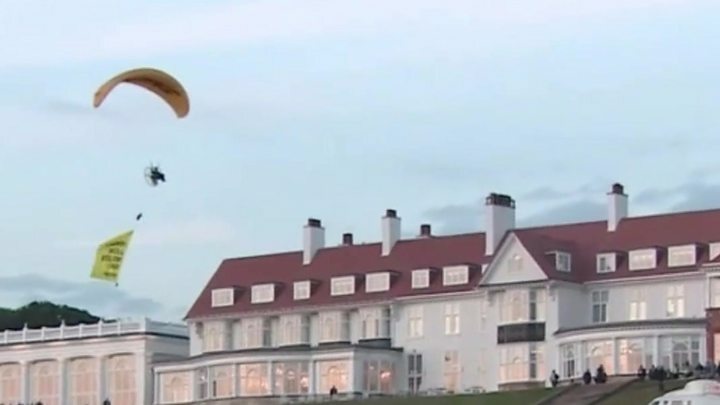 A protester who used a paraglider to get close to President Trump at Turnberry put themselves in "grave danger", according to Police Scotland. Assistant Chief Constable Mark Williams said officers were committed to tracing the person who breached the air exclusion zone around the golf course. The aircraft held a banner reading: "Trump: well below par #resist". Earlier protest organiser Greenpeace said they had given police a 10 to 15 minutes warning. Mr Williams told BBC Scotland that the US president was being protected by armed officers from the US and the UK during his stay at the Ayrshire golf resort. He said: "There are armed assets protecting the president - both from the US Secret Service and ourselves and the Met Police, who offer a close protection function as well. "And there's no doubt anybody who breaches security around him puts themselves in grave danger. "On this occasion we could assess the situation and we realised there was no direct threat to the president however it's absolutely something that is very serious." He confirmed that officers have yet to trace the person responsible for the protest and he appealed for help in tracing them. "The investigation is ongoing through the SCD (specialist crime division) and I would appeal to anybody with any information as to the identity of the pilot of that powered parachute to contact us on 101."